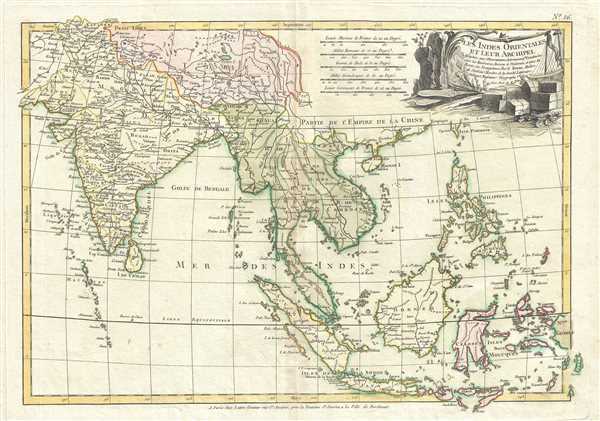 Early map of Southeast Asia identifies the Singapore Strait. This is an attractive 1783 map of India, Southeast Asia and the East Indies by Rigobert Bonne. It covers from Kandahar and the Maldives in the west eastward to include all of India, Southeast Asia (modern day Burma or Myanmar, Thailand or Siam, Malaysia, Cambodia, Vietnam, Laos), the East Indies (Java, Sumatra, Borneo and the Celebes) and the Philippines. Also includes much of Tibet. Identifies countless cities, rivers, waterways, and states throughout the region. Names the Straight Singapore as 'Sin Capura.' Vietnam is divided into the kingdoms of Tonkin and Chochinchine. Includes the Tip of Formosa or Taiwan. Drawn by R. Bonne for issue as plate no. 26 in Jean Lattre's 1776 issue of the Atlas Moderne. Very good. Minor wear and toning along original centerfold. Original platemark visible. Minor foxing.